One of the most common questions I get is “How can I reach financial independence or retire early?” While it’s never been easier to get rich slowly (save 10-20% and invest in index funds), it’s actually a lot harder to fast track your financial independence (when work is optional). And when I say fast track financial independence, I am talking about retiring in 10 years or less from today, even if you are starting with very little. You need to make a lot of money, cut back on your three biggest expenses, invest as much as you can, and keep track of your net-worth using a free tracker like Personal Capital. Honestly, trying to make as much money as you can and reach early retirement can be pretty stressful. There were weeks where I hardly slept and I definitely wasn’t chilling as hard as I hustled. I’m not going to sugar coat it for you–it was the hardest and most intense thing I’ve ever done in my life. While I always say that saving is an opportunity, not a sacrifice, trying to essentially go from broke to financial independence in 6 years requires a pretty big sacrifice. But would I do it again? Absolutely. While tired, I was pretty happy most of the time. I enjoyed the challenge, the discipline, the mistakes, and simply doing something different than 99% of people out there. I like being different and a little weird; it’s just more fun. Chasing early retirement is definitely not the status quo. Most people just didn’t get it. They thought I was crazy. “You save 80% of your income? You have a six figure income so shouldn’t you have a nice car? I’m sorry, Grant, but why do you live in such a crappy apartment when you make so much money?” None of it phased me. I had a goal. It’s what I thought about when I woke up and what I thought about when I went to sleep. How was I going to escape the rat race? How was I going to make more money? 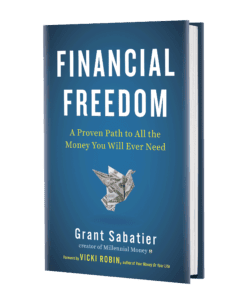 Whether you are just starting your financial independence journey or you are deep in it, here’s how I was able to fast track and go from broke to financial independence in 6 years. This is what I did and what I wished I did (like sleeping more and learning when to treat myself sometimes). In 2010 when I started my financial independence journey, I didn’t set a goal for how long it would take. 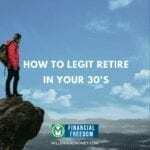 All I knew was that when I did the math I was never going to be able to retire if I was only able to save 5-10% of a $40,000 – $50,000 income. The math I did was pretty simple. If I was able to save $5,000 per year maximum, even with an expected compounding rate of 6%, I would have about $433,000 in 30 years. While that might seem like a lot of money today, it’s not going to be that much in 30 years, because of two expected variables–taxes and inflation. You will need to pay tax on that money when you take it out, assuming a 30% tax rate that cuts the after-tax value to $308,000, which when adjusted for 2% annual conservative inflation amount (it could be higher than this even! ), then the future value of that money after taxes and inflation is approximately $170,000. While $170,000 is still a lot of money, it’s not going to be in 30 years. It definitely won’t be enough to live on for 20+ years. Typical wisdom is that you need 25x your annual expenses to retire early. When I did this calculation, I anticipated my annual expenses would be at least $50,000 in the future (who knows if I will actually be able to live off $50,000 in the future–I sure hope so!). But it was the best starting point I had, so by simply multiplying 25x by $50,000, I determined that I would need to save $1,250,000. That’s a big number, but it was my target. Keeping a budget is really hard and it’s what stops most people from really fast tracking their financial independence. Of course, it’s important to keep track of your money, but if you really want to save, then you need to look first optimize your three biggest expenses–housing, transportation, and food. The average American spends 70% of their money on housing, transportation, and food, so if you can spend less on them (say 25% or so, then you can bank the difference). If you move to a smaller apartment, walk to work, and cook at home, you could realistically increase your savings rate to 25%+ or even higher. At the end of the day it comes down to a personal choice, but I was happy moving to a smaller apartment, moving closer to my office, and eating out less, to bank the difference. And I definitely was able to bank the difference–saving at least an additional $13,000 per year by cutting back. While I don’t have the exact figures, I estimate that cutting back for 2 years, before buying my first home, I was able to save about $25,000 that I invested in 2011 and 2012, and that “cutting back” is now worth more than $100,000 in my investment accounts. I’m going to continue to let it grow and hopefully making that decision 2 years ago will compound in 20 years into a lot more money. It was totally worth cutting back on my three biggest expenses. Try it out. After doing the simple math that making $50,000 was definitely not going to be enough to fast track my financial independence, I knew I had to make a lot more money to invest. I started side hustling intensely in 2010, back when it was just called freelancing or gigging. I’ve probably had over 25 different side hustles over the past 7 years, but the smartest thing I did was invest as much money of my side hustle money as possible. One day in 2011, I sold a $50,000 website project, then that same day, someone who lives in my building posted on the community message board looking for someone to watch his cat for the next few days for $60. I was around for the weekend, so I jumped on it. Two days later, I sold one of my mopeds for a $300 profit. The next week, I resold 4 tickets to a Kanye West show for $550 profit. Today, as I’m writing this in 2017 that $35,910 is now worth about $108,000. The $910 alone that I made on the side increased in value to over $2,700. Not bad for building a website, watching a cat, selling a few tickets, and flipping a model. At the height of my side hustling, I had seven pretty consistent income streams and was only living off one of them. The rest went right into investments. Every day I look for money making opportunities like this and then I do the most important step of all–invest it, so it can grow. First, it’s essential to switch from a saving to an investing mindset. It’s not possible to fast track financial independence by keeping your money in a savings account–investing is an essential ingredient. 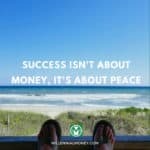 I have made more money through investing than anything else and most of it in my sleep! Just recently, I was looking at my investing returns over a 90 day period and realized that I had made over $15,000 in gains from one of my investments, which is more money than I made in 6 months working at my first job after college. If you really want to make money, then you need to be investing as much money as you can. As I’ve written about before, if you increase your savings/investing rate 1% every year, you can retire up to 2 years earlier, or if you save just 5% more then you could retire 10-15 years earlier. The math is pretty simple and the higher your % saving/investing rate, the faster you will able to reach financial independence. During my most intense months, I was saving 60%+ of my income and 100% of my side hustle income. Earlier this year, I tested myself and was able to save 82% of my total income. While that might be a little extreme, it makes a massive difference for your future net-worth. Remember what I said about living differently? A 50% saving/investing rate is more common than you would think amongst the FIRE (financial independence early retirement) crowd. I know a lot of people that save this much each month because they get it. Saving 50%+ of your income is definitely going against the status quo, but that’s how you fast track wealth. 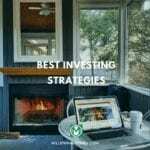 If you want to go deeper, here are two posts on how much money you should be saving and my investing strategy. At 24 years old, with no money, I had no idea how I was going to save my target $1,250,000. It’s been shown in a bunch of research studies that our brains can’t actually comprehend that much money–the numbers are too large and abstract to most people. It was daunting, to say the least. How was I going to make all that money? This is why a lot of retirement calculators just aren’t that effective. They tell you that you’ll need $2,000,000 saved in 30 years, but don’t break down the steps to get you there. Recent psychology research also highlights that our brains work best when we break down large goals into daily goals. I figured out that to reach $1,250,000 in 30 years (expecting a return of 6-7% per year) using my investing strategy, I would need to save $50 per day to retire in 30 years. Every dollar I could save after $50, I would be fast-tracking my financial independence. It’s also worth noting that I didn’t start at $50 per day, I scaled up to it starting at $5 per day and then pushing it a few dollars more when I could. 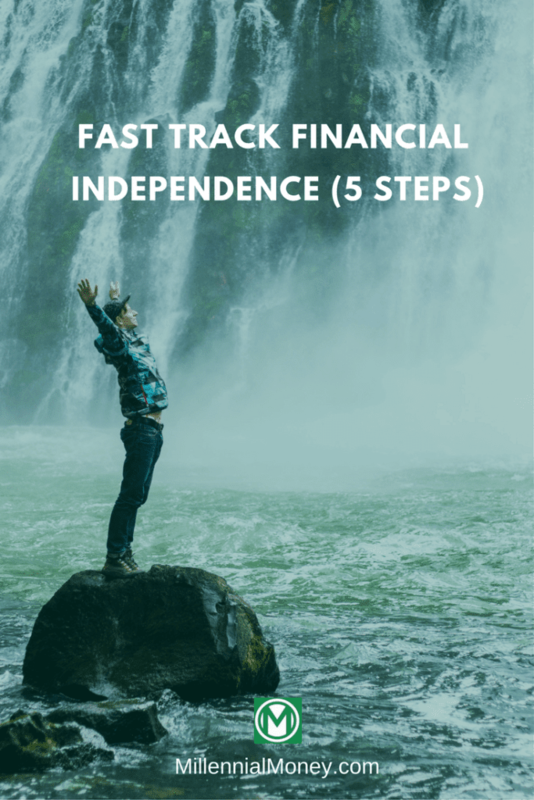 The five steps I used to fast track financial independence are simple in theory but can be difficult in practice. Like many things in life, it’s all about the effort and execution. You need to be consistent. Consistency is more important than anything else–you can’t just follow these steps for a few months. If you want it, you’ll prioritize it. You can also start as slowly or quickly as you want. In 2010 when I made the decision to chase financial independence, I jumped in 100%, but that’s just what I needed to do to get going. The key to building any sustainable results is to start at your own pace, start making more money where you can, and really push your investing percentage higher 1% at a time. It really adds up and every $1 you are investing today will compound as long as you keep it invested. As I’ve mentioned before every $1 I invested in 2010 is worth almost $4 today. It took almost all of my energy for six straight years to go from broke to financially independent. I also got lucky the stock market has grown so much over the past 7 years, but I was ready. Building wealth is about controlling as many of the variables as you can and then letting it grow. I’d also add to avoid debt like the freakin’ plague. Any negative against your net worth will potentially slow down your retirement date by years. Great point! Definitely avoid debt as much as possible, unless you can leverage it for real estate – but you have to be careful there too. Thanks Mrs. Picky Pincher. “Live like no one else, so you can LIVE like nobody else!” I love it. I’m focusing on increasing my investment rate right now, as I’m saving about $2k a month in cash. I like this number, but think it would be better to save $1k in cash, and another $1k in other investments. Congrats Erik. I am keeping more in cash too right now as well, but not for long. As always, really great stuff, Grant! Thanks for the motivation. RIGHT ON! This article is awesome. In our schedule to share! Working on decreasing our spending to live off of one of our incomes. I like the breaking it down part. Seeing a number in the millions is daunting, and a lot of the reason some people give up before even trying! Breaking it down into bite-sized chunks gives you something to work toward. I like using that and Savings Rate to benchmark how far off I am. The next thing for me is growing my side hustle income and banking every dollar of that. Sounds good Dave. Side hustling to invest is definitely key! Your posts always inspire me to keep trying – especially when it seems too hard. So thanks! Investing is so crucial when it comes to financial independence and passive income. Whether that’s investing in index funds, a business, or real estate. It all compounds with patience. Thanks Matt. I appreciate the kinds words. There is no “Get Rich Quick” scheme that doesn’t involve a ton of risk, or marrying into money. But this article is a great option for those that want to expedite the process. Love how you put things small steps (1% increase in savings) into a larger context (retire two years earlier). Great post! I love that you emphasize the 3 big expenses to minimize. I can’t stand pinching every penny, but I can absolutely make sure I’m not overspending on housing, transport, or food, which is probably the 20% of my expenses that will account for 80% of my savings! With Vangaurd or other similar methods, how are you protected when the next 2001 or 2008 or worse happens? As you know those 30-50% plus downturns happen very very fast and furious to the downside leaving precious little time to react. It can also devastate progress and force slow comebacks without being able to lock in many years of gains. I do get the idea of long term views and riding out the downturns. However, I am very curious if you have a plan in place for when this happens again? I could mention my thoughts but do not want to taint your thoughts on this very important consideration. Great question Greg. I have been keeping more money in cash than every before, so I am definitely starting to hedge more than I have before. So my plan is to have more cash on hand when this happens and be able to buy low if the market drops, as well as have enough cash on hand to sustain me for a few years while the market is recovering. So if it drops 30% I’ll be able to get in lower and over the long term be significantly ahead. What is your plan? Wish these web sites were available 40 years ago when my wife and I started on the FI journey. We have been retired for several years now and living well without any money worries for the lifestyle we live. Your advice is absolutely correct. The average person / family or even someone that is a little above average in terms of income can not save their way to FI. You have to save, and plan, and invest. The vast majority of your nest egg will come from “earnings” made by the money invested. Live below your financial means and save and invest the difference if you want to become FI at an age well below 65. Thansk Redfish! I appreciate the kind words ? I like Redfish’s post…so true, age tested and proven ! Live within your means, avoid impulse purchase, save and invest. It literally pays to know the difference between “need” and “want”. The power of compounding is astounding. I am very close to reaching the milestone. The first was hard. It should be much better from here on out. Congratulations to those who have already reached and best wishes to those aspiring. Good job and good luck ! Great post, Grant! Thanks for the extra motivation. Although I set the goal to save at least 14% of my income on the blog, I’ve already increased that goal to a minimum of 21% thanks to podcasts I’ve been listening to and reading posts like this. I’ll be looking to build better habits and continue looking for ways to bring that 21% higher going forward. Like you said, every dollar can help to fast track your journey to FI. Thanks for sharing! Thanks Graham. Congrats on increasing your savings rate. Keep it up and happy to help. Food has always been my Achilles heel. I hate cooking in general and eat out at expensive places far too often. I’ve often contemplated what’s the ROI on marrying someone that likes to cook a lot (kidding/not kidding). Grant, I’ve been binging on your podcast and reading your blogs the past few weeks. Thank you for putting out all of these resources for your readers. I want to learn more about your method of investing. I put aside quite a bit of cash, but sometimes it’s difficult to make the daily decision to invest immediately due to the high pricing on certain equities/stocks and the fact that there are trading commissions involved. In other words, I am sitting on some cash, but can’t pull the trigger to invest. How do you deal with this, especially when you were putting away $5 a day? Hi PCK, This is one of the reasons I started investing daily – to both make it a routine and take the decision making out of it. It’s impossible to time the market, so it’s counterproductive for long term investing to worry about the “high price” of equities on any given day. Through dollar cost average and investing in index funds (where I am not paying a Vanguard commission because I use Vanguard to buy Vanguard funds! ), it’s a daily habit that really adds up. I can see how the commissions on individual equity trades could get expensive if you are trying to do it daily. Great question! Great article! Thanks for all the info!!! I just have a question…so did you put this invested money in a tax deferred account (retirement account)? Or was it a regular account? Thanks for sharing this awesome way to fast track financial independence. The next thing for me is growing my side hustle income and banking every dollar of that.